The new ion exchange resins from Lanxess will provide more environmentally-friendly brine purification. LANXESS Liquid Purification Technologies will present its chelating resins, a new class of ion exchange resins, at the FlemionTM Seminar, in Amsterdam from 23-25 October. Part of the Lewatit MDS line for brine purification in chlor-alkali electrolysis, the new generation of finely dispersed Lewatit ion exchange resins will increase the efficiency of brine treatment in chlor-alkali electrolysis using the membrane method. They prevent damage to the latest ion exchange membranes used for electrolysis, which are becoming more and more sensitive to prolong their service life. With the fine monodisperse, macroporous chelating resins of the Lewatit MDS series, brine purification in chlor-alkali electrolysis using the membrane method can be more efficient. 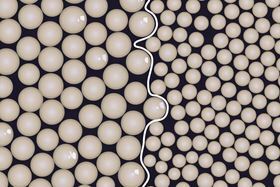 The difference between the new resin types and those previously offered is the bead diameter. This is only 390 µm for the MDS types (Mono Disperse Small, such as Lewatit MDS TP 208) and so is around 40% smaller than for the Lewatit MonoPlus TP 208, which is also monodisperse. As a result, the MDS types have improved kinetics, a higher degree of regeneration and an increased total and operating capacity especially for alkaline earth cations. They have optimal mechanical and osmotic stability and barium and strontium ions are separated particularly efficiently from the brine. Bettina Blottko is appointed head of Lanxess’s Liquid Purification Technologies business unit.